The frenzied gathering of students and teachers in a Killeen High School parking lot contained all the markings of a large family finally loading up for a long-planned trip, a mission trip of sorts. 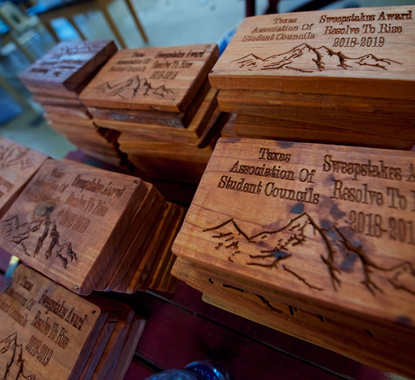 Before the first bell Friday, KHS student council members, teacher sponsors and other supporters labored to assemble wooden game pieces, newly-made plaques, their own personal luggage and a myriad of supplies, enough to conduct a major conference 135 miles away. In all, 66 students and eight adult chaperones loaded buses, cars and a trailer and left town en route to the 83rd annual Texas Association of Student Councils State Conference April 14 to 16 at the Arlington Convention Center. The Killeen High School council members, this year’s “host” of the event in Arlington, will set up Saturday for a series of large sessions and smaller workshop sessions Sunday, Monday and Tuesday. The supplies, crowded into the KHS FFA building for storage before the group loaded it up Friday, represented about two years of planning and preparation, finally about to blossom to full fruition. 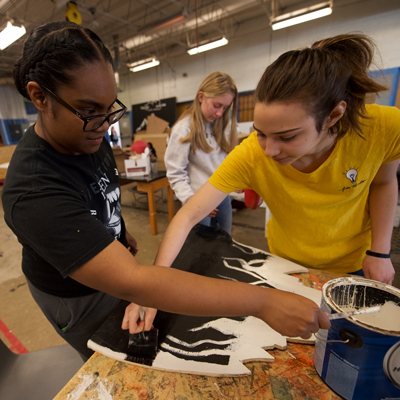 As she guided arriving students to shift and pack items and even break out some paint to touch-up stage sets, teacher Jennifer Larkin expressed tired confidence that it would all come together. It was at the annual student council conference two years ago, then-sophomore Jordan Lucena expressed to council advisor Travis Waltz desire to organize the huge effort during his senior year. From that suggestion, Waltz said it has been a student-driving effort. Hard-working council members met weekly throughout the school year on top of their regular activities to plan, organize, design and piece together the elements of an event expected to attract 5,000 students from across the state. 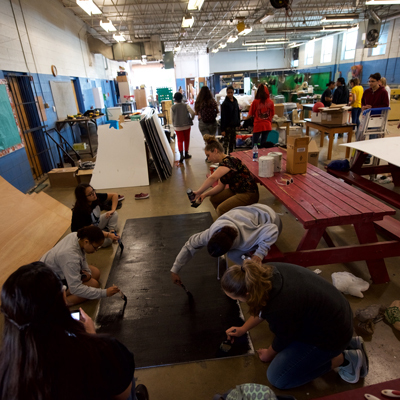 They formed their own booster club, raised money, booked two speakers and designed and built several team-building, problem-solving games to entertain and challenge participants. They also formed stage pieces with a mountain range to illustrate the theme “Resolve to Rise,” and even recruited the school’s Kangarettes dance team and Island Dancers to choreograph dances and come along to perform.